Market Manila - Burrata & Baby Arugula - Other Food Products, Kitchen Equipment, Etc. Flown in from Italy, they apparently are on offer at one of the purveyors I have featured on marketmanila.com before, but I am not sure if I am at liberty to mention the source just yet. Suffice it to say I was thrilled to get some as a gift, and I had a good idea what I was going to do with the cheese. With these two “prize” ingredients on hand… what to cook, what to cook… up next. I haven’t seen those before. Can’t wait for your next post. I cannot wait for what happens next. The burrata looks amazing. I can only imagine what kind of reception burrata could get in Manila (if ever it becomes popular), even among cheese-skeptics. You should try the micro arugula from Market!Market!, Fresh Fields I think. Quite expensive but they look nice when plated. Just make sure to wash it well since there’s quite a bit of sand. wanna try this. thanks for posting. i saw MF partaking this in one of the pics somewhere. Zoi…if you want to now where to get this, call Bosa foods in Burnaby and phone first…it is flown in from Italy and since it is highly perishable, it is sold really immediately. Another one is Market Meats on West. 4th. But I would buy it at Bosa since it is a busy place so the turnover is really fast and therefore really fresh! Another one is Scardillo…somewhere on Hastings…I think it is locally made …so call first if they have freshly made fresh mozarella or burrata done in the morning…best day to call is MOndays! In Duncan, there is a farm that has water buffalo herd and the milk is turned into fresh mozzarella by nearby Natural Pastures…I think it is available at Whole Foods and could be at Thrifty’s since it is an Island grocery chain. Yummy I know who gave it to you!!! MF……. I think its still available at Lusso in greenbelt. I got mine from Igourmet.com here in NYC .. you should try in on a Bruschetta with roasted fresh figs sea salt and fresh ground peeper and a few drops of good olive oil.. 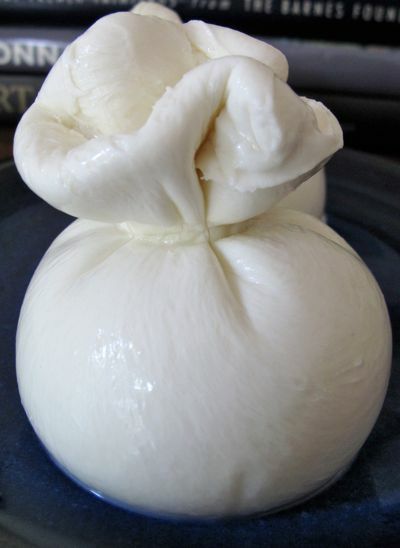 I had burrata in Umbria this summer and loved it! 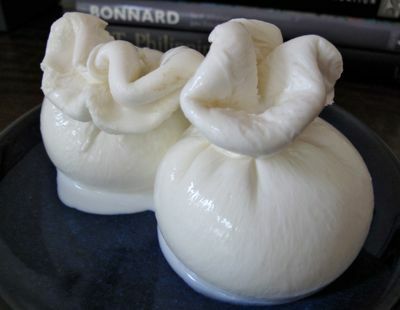 Mmm…I love burrata–but as bettyQ mentioned it is HIGHLY perishable so do be careful as to your source. 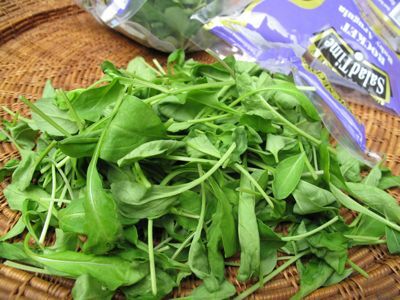 Marketman–the peppery bite of arugula is very dependent on the variety, not just the age at which the leaves are harvested. I do think many producers harvest way too late…all arugula is best harvested young to use raw, older tougher/more pungent leaves are fine for cooking. I’ve grown a few varieties over the years and the taste spectrum is surprisingly wide. this cheese looks yummy! hmm i’m gonna try and get my hands on one here in melbourne if i’m lucky enough =) is it bland tasting like a normal mozzarella MM? what a treat and what good friends you have! Thank you always for bringing the new and the traditional (of other cultures) Always good to learn from you and the readers of this blog. MM, when you finally are at liberty to mention the source, do let us know, will you? :-) that picture is just absolutely beautiful! i wonder if we can produce it here, with our good ol’ kalabaws. Yummy goodness. I grill or toast some artisan bread, rub both sides with fresh garlic, top it with sliced tomatoes and basil, some sea salt and a chunk of mozzarella di bufala. ENYA, yes the arugula is local, sorry, forgot to mention that. basic Neessity has a packaging plant on the Silang road up to Tagaytay. You can sometimes stop there and buy whatever they have in at that time. i love burrata :) the restaurant i used to work at had a supplier that made it right in her own home and she would customize them for us by adding honey, lavender and chili to the center cheese. When in season we would also have one with figs made. *heaven* Served with a tossed salad and crostini. 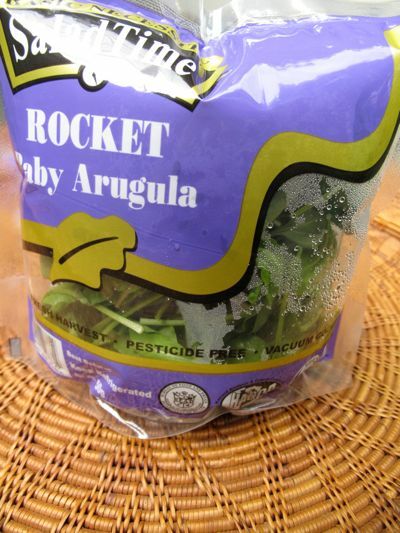 i noticed that baby arugula has mild taste, good for salads only. i tried using it in my arugula & basil lasagna,didnt give much punch. maybe i shouldnt have blanched it. but in pizzas, isnt better to use to local big ones? generates a better taste combined with parma ham. Anyone interested in Burrata , can txt or call me 09154934039. Leandro’s Artisanal Buffalo Cheese maker of Buffalo Mozzarella , Burrata .